Home › Line of Fire › Brown Lends Lentz A Spine? “You are the ones who justify yourselves in the eyes of others, but God knows your hearts. As seen in our many articles covering Carl Lentz, he has proven to be quite biblically illiterate when it comes to addressing tough topics, this same lack of biblical literacy seen in his ‘pastoral’ oversight Brian Houston. Unfortunately this means Michael Brown will believe anything Lentz says, once again demonstrating he is incapable of discerning the true Christians leader from the false. It’s becoming painfully obvious that what seems to be Michael Brown’s highest governing authority is not the Word of God. It’s the words of men. 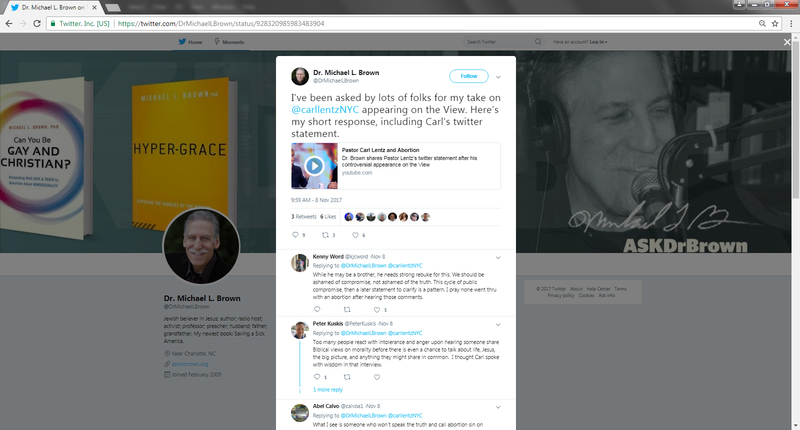 Time and again, Michael Brown appeals to the personal relationship he has with false teachers in order to justify their most ungodly teachings, practices and behaviours, always lending them credibility and standing with them in their error. In other words, he’s become the spine for the spineless. I’ve been asked by lots of folks for my take on @carllentzNYC appearing on the View. Here’s my short response, including Carl’s twitter statement. The video in the tweet has Michael Brown simply be a mouthpiece to defend Carl Lentz. If that is not enough, Brown recently advertised the following on Twitter. 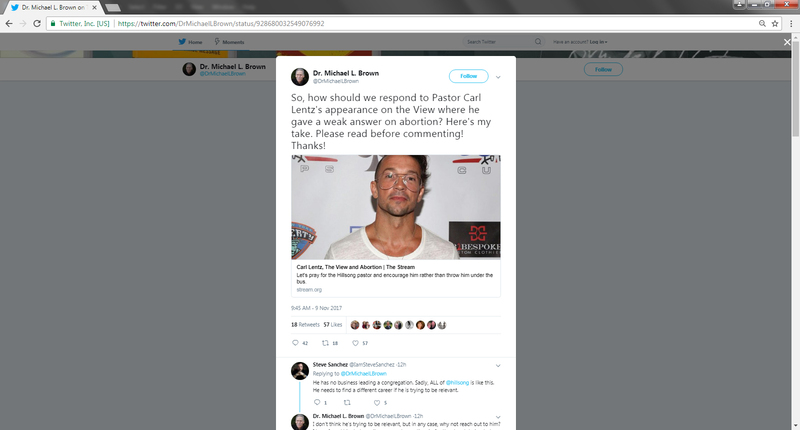 So, how should we respond to Pastor Carl Lentz’s appearance on the View where he gave a weak answer on abortion? Here’s my take. Please read before commenting! Thanks! The link he provides leads his readers to an article he wrote defending Carl Lentz. Let’s pray for the Hillsong pastor and encourage him rather than throw him under the bus. After his appearance on The View on October 30, Carl Lentz, pastor of Hillsong Church in New York City, was blasted for what appeared to be a total cop-out answer on national TV. To be perfectly honest, if I didn’t know Pastor Lentz personally, my response would have been just as strong (and swift). It appeared that he dodged a very simple question, one that required a very simple answer. Really now, is there any ambiguity when it comes to abortion? We’re talking about taking the life of a preborn child. What is unclear or uncertain about that? But because I have found Pastor Lentz to be both approachable and teachable, rather than comment on his interview first, I reached out to him directly. Why, then, did he give such an ambiguous answer on The View? Again, do I wish he did things differently? Absolutely, but he gives account to God not to me. Recently in an interview, I was asked directly if abortion was sin. I did not answer the question directly for a number of reasons and that has caused some confusion about our stance as a church on this matter. I do believe abortion is sinful. Our prayer is that we can continue to help and love those that deal with the pain of regret from personal choices, rather than cast further shame and guilt on those already carrying so much and create a church that can teach people how to form convictions based on God’s word, that will be the driving force in all their decisions. I will continue to point people to Jesus, above all else, every opportunity I get. The story of God’s redemptive grace, available to all, is the best news available. I know that many remain disappointed in Pastor Lentz and some believe his Twitter post was too little too late. But since he had made his position clear in 2015 (in a totally secular context) and has now reiterated that he believes abortion is sinful, I suggest that we pray for him and encourage him rather than throw him under the bus. My prayer is that God will make Carl Lentz a champion in the pro-life movement, a clear voice of grace and truth, and one who also helps many of those who have had abortions to find new life in Jesus. To the best of my knowledge, Pastor Lentz would warmly welcome such prayers. ‹ Carl Lentz refuses to “own the moment” with his view on abortion.